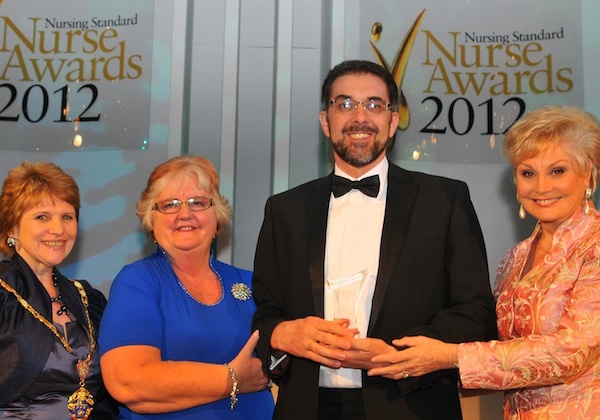 MHF chair Alan White has won the Robert Tiffany International Award at the Nursing Standard Nurse Awards for his pioneering research into men’s health in Europe. The prestigious annual ceremony was hosted by broadcaster Angela Rippon and held in London’s Park Lane Hilton hotel last month. Alan, who is chair of the MHF's board of trustees, was the world's first professor of men's health and runs the Leeds Metropolitan’s Centre for Men’s Health Research. Last year he led a 36-strong international team of academics to produce The State of Men’s Health in Europe Report for the European Commission. The picture below shows, left to right: Andrea Spryopoulos, president of the Royal College of Nursing; Dame Chris Beasley, chief nursing officer for England; Alan White and Angela Rippon.